This is a first in a thoroughgoing number of articles about emergency preparedness, disaster recovery, emergency response, emergency survival, kids survival, and survival safety, that I intend to give to you by the end of September, 2008. The articles should give you a disaster plan that covers everything that you need to know about survival, for your family disaster preparedness in the coming times. To find the rest of the articles, search my name, Tru Keesey, along with the topic that you want to know more about, for example "disaster plan" "survival tips", or "kids survival". 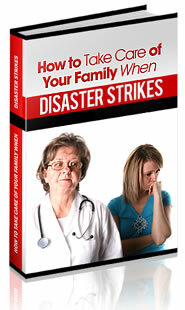 There is a list of possible events that require disaster preparedness for every family. This is the list that is commonly thought of: earthquake, volcano, flood, hail, tornado, hurricane, bombs, tsunami, meteor collision, economic collapse, and NBC, which means nuclear, biological, and chemical warfare threats. Maybe I left one or two out of the list, but it is no matter. What most disaster planning has, until now, tended to leave out is the combined threat of a police state, invasion, and / or race war (any combination of the 3) contrived by the new world order in the service of the investigation. Why Did I Say "Vs."? The title of this article is "Emergency Preparedness Vs. Disaster Recovery". Why "Vs.", instead of "and"? Because I believe that proper previous preparation prevents disasters. When we prepare properly, there is no disaster to recover from. So what kind of emergency planning will prevent an invasion, race war, investigation by the blue army, and a police state? While all the survival skills, that have been successfully used in history, the two that have recently been neglected the most, among our people, are "security in numbers", and "organization". Family survival preparedness means that families must become independent of two alien governments, which are, to wit, the world freemasonic government out of London, and the Vatican. Family survival preparedness demands that families, who are not involved in freemasonry, nor with the Vatican, must group themselves together locally, then network with other family groups around the Earth. How Defensible Do You Want To Be? The larger your network, the more defensible can you be. Your family survival and emergency preparedness depend upon the size of your network. Be careful, though. Up until now, the downfall of many networks has been caused by the inclusion of disloyal members. Any Freemason in a network has sworn an oat of loyalty and obedience to the alien government called "world freemasonry". He may have only sworn to obey a particular individual, but that individual has sworn obedience to someone farther up the chain of command, and it leads to the Duke of Kent, who must obey the Queen of England. Thus, there is no safety nor protection in a network that has in it Freemasons, because their loyalty can be compromised by the alien government that they have sworn to obey. The same is true of the Vatican, although in the lower levels the shackles are more of an economic, superstitious, and emotional nature, rather than by a human oath. Lower level servants of the Vatican have strong economic and family ties to the Vatican's network. Many of the Vatican's supporters have been fooled by the superstitious belief that Peter the apostle founded the church of Rome, or that the pope is the infallible surrogate of God on Earth. In fact, Roman catholic canon law states that any human, who does not believe in the infallibility of the pope, is anathema. So it is impossible to be a "true catholic" without believing that the pope is to be regarded as if he were God. I only mention the above facts to show that servants of the government, which has been known as the Vatican, although they may not have taken an oath, neverless have strong bonds and ties that bind them to obey the hierarchy of the church of Rome, under the command of the pope and the Jesuit general. It is because of those bonds, and because of the hostility of the leadership towards non-Roman-Catholics, that servants of the Vatican can not be relied upon as members of a family survival network. Form your network of families now, and avoid including supporters of alien governments.